FRISCO, Texas - Authorities confirmed Thursday that the bodies of a man and woman found at a suburban Dallas home are the parents of a 10-year-old boy found dead in a bathtub at the same house back in January -- a death for which the mother was charged with murder. The Collin County medical examiner confirmed that the bodies found Wednesday are those of Sumeet Dhawan, 43, and Pallavi Dhawan, 39, Frisco police said in a statement. Pallavi Dhawan had been free on $50,000 bond after Frisco police charged her with murder in the death of the Dhawans' son, Arnav. CBS DFW reports a grand jury was in the process of investigating the murder charge and possibly indicting the boy's mother. According to the station, the family said Arnav died from a seizure. A medical examiner's report had said a natural cause was the most likely cause of the child's death. However, police said Pallavi Dhawan had confessed to killing the boy -- something the family's attorney, David Finn, has strenuously denied, claiming a language barrier led the mother to misinterpret the question. 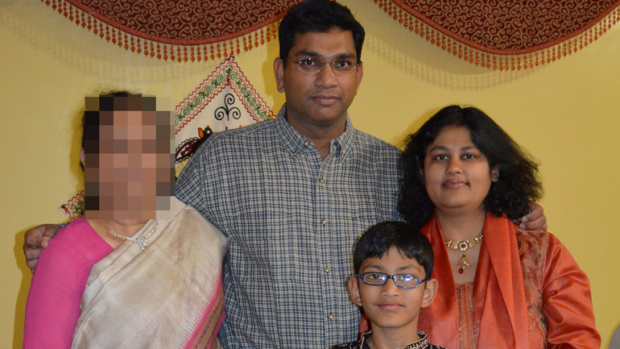 A family friend told CBS DFW that relatives were concerned after not hearing back from Sumeet Dhawan for several days. His brother and a friend went to check on him at the house Wednesday afternoon, and called 911 after discovering a woman's body in the backyard pool. Officers on the scene found Pallavi Dhawan's body in the pool and Sumeet Dhawan's body in the house. Police are not saying how they died, and Finn said he had not been told if any marks were found on their bodies. Assistant Police Chief Darren Stevens said the department has been in contact with the extended Dhawan family "and are doing everything possible to keep them informed over the course of this investigation." Officers had found Arnav's body on Jan. 29 while making a welfare check at the house. He was wrapped in a cloth up to the neck, and there were empty plastic bags in the tub next to him. A police affidavit says Sumeet Dhawan told investigators that his wife was having mental health issues and that they had been having marital problems. Since Pallavi Dhawan's release on bond, Finn had expressed impatience with the police handling of their investigation in light of the medical examiner's findings. Finn has said that Arnav was a special-needs child, born with a brain cyst and microcephaly, a condition characterized by an abnormally small head, which could have factored in his death. On Thursday, however, Finn acknowledged: "I'm not sure that we'll ever know what happened." Finn said he had been in contact with Sumeet Dhawan's relatives, who hope to send the bodies back to India for cremation in accordance with Hindu tradition. It's not clear if the bodies are in a condition suitable for the trip. If they aren't, "they'll be cremated and the ashes sent back to India," Finn said.